January and February is a fantastic time of year for new life all over the world! And activity in the Arctic is of no exception, even though the freezing temperatures may have you thinking differently. 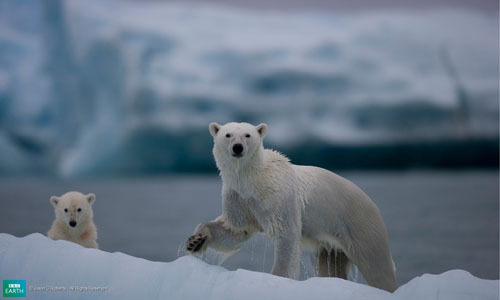 Surviving and succeeding in the most extreme elements, the polar bear is one of nature’s great fighters. And it starts from day one. Born in the darkness of December, within the mountainous areas of the Arctic Circle, the first few weeks of these cubs’ life would be fraught with danger if it wasn’t for one thing: the dedication of their mother. After consuming huge amounts of food (almost doubling their body weight!) in preparation for hibernation, the female polar bear will first wait for the sea ice to break up. Then in the snow drifts near the coastal waters, will go about making her den that will be her resting place for the next three to four months. Resting in their deep warm nesting place, the polar bear mother will usually give birth to a pair of cubs. Born blind and deaf, these vulnerable bears take several weeks to develop even the basic abilities of seeing, hearing, smelling and walking. However with the dens insulation and their mother’s fur and fatty milk, they’ll be off to a fighting start in no time. And when the time does come, how exciting it is! 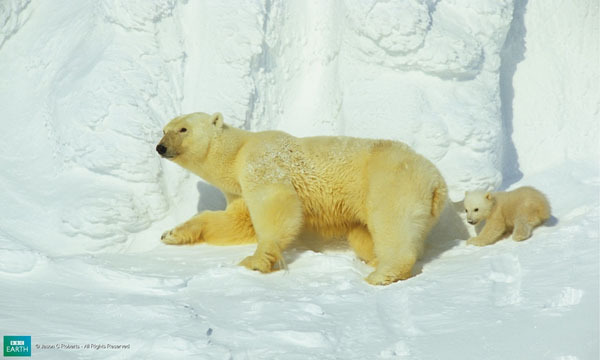 With the cubs weighing about 25 pounds and with the right weather conditions, the polar bear mother will break the den. Heading out on her own initially, mum will enjoy the shining sun, open space and fresh snow that she has been without throughout this entire process. And then it’s time for the cubs. Although it’s no easy ride! The first breaths of the cold Arctic air and their inexperience of the snowy terrain means they won’t be traveling far a few weeks yet. However mum will continue to nurse them, they will learn communication and socialization skills through play with each other, and then the journey begins down the great slopes… to find their first tasty meal.